ORCSDcleanslate busy voter guide: Vote for Kenny Rotner (website) and Tom Newkirk for school board. The third candidate doesn't actually want the job. I'm voting YES on all the articles; if you don't want to spend $2.3M on the field, vote NO on #3, and maybe even NO on #6 and #5 as well, as the capital fund mentioned can also be used to fund the field. Please vote YES on the #8, the $42.3M budget appropriation. The board kept the budget tight this year; if NO wins and we get the default budget, taxpayers save a whopping $58,000, about a seventh of a percent. News From Tonight's Meeting: The board approved a two-year agreement for Oyster River and Portsmouth to form a cooperative high school girls ice hockey team, hosted by Oyster River. Approval by NHIAA is expected by May. Approximately three to five Portsmouth players will join ORHS's team next year for a team size of around 16. The hope is in two years Portsmouth and Oyster River can each support a team of their own and the coop would then not be renewed. The decision on the proposed football coop hosted by Portsmouth was put off until the next meeting. ORCSDcleanslate asks Lee voters to vote YES on Lee article 3, the Lee Sustainability Committee. Paul Gasowski did a great job starting the Oyster River Sustainability Committee, eventually leading to energy savings of over $100,000 annually, and we're hoping he'll work similar magic in Lee. Also please vote NO on Lee article 18 and keep Tibbits Road the way it is, instead of gating and closing it so UNH can sell it. It seems there's nothing in it for us to change, at Deliberative Session the vote was unanimous against, Barrington has indicated it will ask for compensation if it passes, and some selectman are trying to withdraw their recommendation (too late). The only YES argument I've heard is maybe the buyer will commercially develop that spot, which would be a boon to Lee taxpayers. But if that's what Lee wants, we can do better than "maybe." ORCSDcleanslate asks Durham voters to vote for current ORCSD vice chair Al Howland for Durham town council. This is my annual guide to the 2016 Oyster River School District election. I call it a biased guide because in addition to (I hope fairly) explaining each warrant article, I tell you how I'm going to vote and why, which is the biased part. For each question, I'll write a bit and sometimes provide links to previous posts for those interested in digging deeper. Election day in Oyster River is this Tuesday, March 8th. If you're a US citizen over 18 who lives in Lee, Madbury or Durham, you can just show up on Tuesday at your town's polling place and vote. Like almost all elections in New Hampshire, same day registration is available. So even if you've never voted or registered to vote in New Hampshire before, you can vote Tuesday. It's easier if everyone brings a state photo ID and if new registrants also bring proof of address (a utility bill), but under New Hampshire's voter ID law you can vote even if don't bring those. As always, voters in each town are given identical school district ballots. Let's go through the ballot questions, also known as the warrant articles. Article 1 elects the district moderator. As far as I can tell, the only real duty of the moderator is to run the deliberative session in February. (I often see Mr. Laughton running between polling places on election day, so the moderator may have some responsibilities then as well.) For as long as I've been paying attention it's been Richard Laughton, and as he's the only one running, the trend will continue. Article 2 elects two of seven school board members. Dr. Kenny Rotner (website) has been on the board for three years, and also serves on the Durham Town Council. Dr. Tom Newkirk has been on the board for the last four years and currently serves as Chair. I think Tom and Kenny have done a great job since taking over from the bad Brackett board, and I am very happy to vote for them both for reelection. Ms. Redhouse is the newcomer. She announced on Candidates Night that she wasn't intending to get elected and that her goal was to use the platform to publicize her concerns about Lyme Disease. Given that only seven members of the public showed up on Candidates Night and the district doesn't seem to have bothered to post the video apparently my blog mentions are about the only publicity she got, so I'd say she failed. I don't want to condone this sort of appropriation of the election process, so I'm hoping she gets zero votes. We should really punish her by electing her, but let's not. Article 3 is what I've breezily referred to as the field bond. I've been writing about the field for a couple of years now, but I'll try to start from the basics here. Currently, we have a grass field behind the high school. That's the ideal anyway; in practice, the field is often lots of packed dirt (or mud) without all that much grass due to overuse. We'd need at least twice the space to use only a portion of the fields while the grass grows back on the rest, which is the suggested practice for natural grass fields. 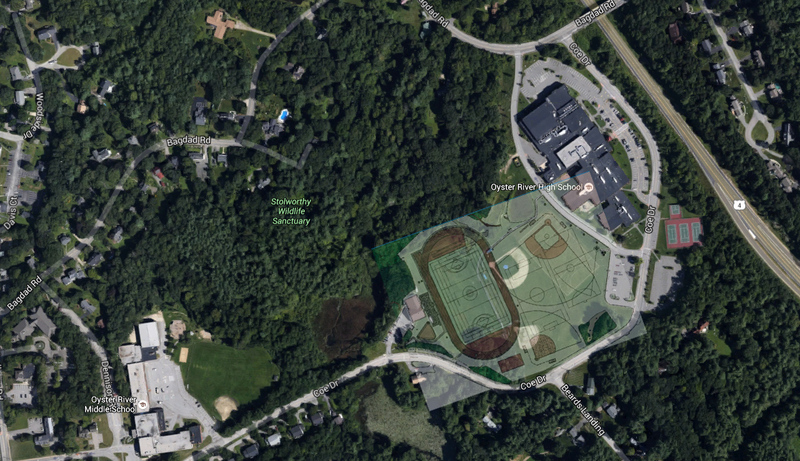 From all the woods around the school you might think that the district could purchase the space, but attempts have failed to uncover opportunities to expand the school's footprint at an acceptable price. The solution is to install an artificial turf track and field over about a third of the current field area. The artificial field can support virtually continuous play of all field sports, about four times the utility of the same size grass field, with faster recovery after snow and rain. The grass sports fields on the remaining two-thirds of the land will be reoriented for safety reasons, but the bulk of the cost and work is the construction of the artificial turf track and field. and field at Southwest Minnesota State. This is largely the same proposal that lost last year with 54.6% of the vote. (State law requires a 60% supermajority to pass a bond.) The main differences between this year and last year: The amount bonded has gone down from $1.7M to $1.5M, a product called EPDM has been substituted for the potentially harmful rubber tire crumb infill, and the price increased by $300K to $2.3M due to the new infill. One source of the $800K needed in addition to the bond is the Facilities Development Capital Reserve Expendable Trust Fund. The important thing to remember here is the same fund is funded in articles #5 and #6 (without the words "Expendable Trust" which may be an editing error). So if you support the field, vote YES on those too. There was a fair amount of marketing effort this year. I see "vote yes on 3" signs around town. At most evening events there have been some pro-field folks giving out literature. I haven't seen much aimed at voters who aren't the parents of schoolchildren, and those folks are the ones that need to be won over. Hopefully some marketing effort was spent there. Similar field bonds have failed four times in the past, each time getting above 50% but failing to reach 60%. The voters were in a kind of grumpy, no spending mood last year (see, for example, the Lee Library vote) and 54.6% YES wasn't really all that close to the 60% needed (136 NO voters of 2529 total voters would need to switch their votes to YES). The supporters are hoping the presumably safer infill, lower bond amount, and the vote YES campaign will get us over 60%. All board members support the new field. The budget discussion started this year with an attempt to fund the field without a bond, which would only require 50% taxpayer support (if it was on the ballot at all, 1 2 3). But a couple of budget shocks related to health insurance made this impractical and we were back to the bond. The board discussion about whether to include essentially the same losing bond proposal as last year on the ballot again was interesting. Member Barth expressed the concern that another failure on election day would be detrimental to the cause. Chairman Newkirk voiced his support for inclusion by channeling Ken Kesey: "You're either on the bus or off the bus." I thought that was ironically apt; you must be tripping if you think the fifth time's the charm. One reason to try to get this passed sooner rather than later is that there are big middle school expenses on the horizon, with talk of possibly building a whole new school. I suppose the fear is that paying for a big ticket item like a school would shove aside luxuries like a field. On the other hand, every haberdasher knows it's easier to sell shirts and ties after the customer chooses a suit, as the additional money seems relatively small. Maybe if all else fails, the field will get tacked on to the new middle school construction project. One of the more ludicrous arguments the district makes is about all the money we'll save by having our own field. They came up with a few thousand in rental fees for other fields and a few more thousand for fertilizer and transportation and maybe some other stuff I'm not recalling. They even dangled the possibility of field income -- others renting our field. I haven't seen it added all up, but if it generously comes to $20,000 a year, that means the field pays for itself in a quick 115 years. That's not even counting the cost of maintenance that the new field would require. The field is a shiny new toy we want for our kids; trying to spin it as cost savings just makes me doubt the district's credibility on other matters. Back of the envelope, a $1.5M 10 yr bond works out to $150K annual principal and say $30K interest, which is about a 0.5% increase in your taxes for the next ten years. I'm voting YES because, as much as I'd rather avoid paying for it, a top high school needs a commensurate athletic facility. The fields we have now are kind of embarrassing. I think it's pretty likely if you support football at ORHS you're a YES vote for the field. One reason to vote NO is that it looks like at the board meeting tonight the district will enter into a cooperative agreement with Portsmouth High to allow Oyster River kids to play football on Portsmouth's Division 1 team. [Update 3/3: this decision was postponed to March 16.] Portsmouth has already voiced its intent to end the agreement as soon as its enrollment falls to the point it can play in Division 2. At that point, there's going to be pressure to field a football team at ORHS, which is going to be a lot easier to do if there's a big artificial turf field on the premises. Article 4 ratifies the contract the board negotiated with ORESPA. The board and ORESPA, the custodians and secretaries union, agreed to a first-year raise of 1.5%, second year 2.25% and third year 2.5%. I'm voting YES. Just to be clear, the dollar amounts in the article are not individual salaries or anything like that. Each number is the total additional money (as compared to the previous year) needed to pay the combined raises for all secretaries and custodians. I'm always surprised that 20-40% of the voters vote NO on these contracts. The board has kept, and continues to keep a pretty tight lid on the raises, which are running at close to the cost of living. Article 5 asks the voters for permission to sell a donated parcel of land and put the proceeds (likely in the $275K - $400K range) in the Facilities Development Capital Reserve Fund. Despite the slightly mismatched names, this is the same fund as the one referred to in article 3. This is important, because even though this article doesn't spell it out in the explanation, the money in this fund can go toward the new field. Since there's no bond, the article itself only needs 50% to pass. So, if you support the field, vote YES here. That's what I'm doing. If you don't support the field, this is a more difficult question. The money won't necessarily go to the field; it can be used for other facilities development. This article and the next are what's left of the original plan to fund the field without a bond. The three articles are written in a way such that if they all pass, all the money can go toward building the field immediately, but if only articles 5 and 6 pass (more likely as they only require 50%) we can bank the money and try similar articles next year, which if passed should be enough to build the field. The district explored possible uses for the land, which is on Orchard Drive off of Mill Road in Durham. They couldn't find any good uses for the land, which is mostly wetlands, and decided to sell. I think it was John Parsons at the deliberative session who pointed out that voters around 8 years ago had already given the district permission to sell the parcel. I was surprised to hear this and haven't tried to verify it. I think the board members and administration were surprised to hear it as well. Presumably 8 years ago there was nothing about the Facilities Fund, so it still makes sense to go ahead with this article. Article 6 asks the voters to put aside $500K to add to the Facilities fund. As previously discussed, even though it's not mentioned in the explanation, this money can go toward purchasing the new field. So if you're voting YES on article 3, you should vote YES here too. The fund balance is the money the voters appropriated last election day that the district didn't get around to spending. I'm voting YES. The main thing that bothers me about this article is the sentence "No amount to be raised by taxation." While not exactly a lie, this is quite misleading spin. The fund balance, being the leftover money, was largely raised from taxation this past year. A NO win means the funds will be returned to the taxpayers, lowering the coming year's tax bills. The fund balance isn't some magic way to pay for things without impact; a YES win requires an additional $500K from the taxpayers. Even though it's boilerplate marketing, the "no amount raised ..." spin still annoys me. Article 7 implements the plan of selling old equipment for funds to provide needy students with new technology. This seems a pretty good way to help the underprivileged students. At an initial appropriation of $1 and a maximum of $2,000, this has essentially no impact on taxes. I'm voting YES. Article 8 is, of course, the main budget article, asking the voters to spend $42.3M on schools. I'm voting YES. About 1/3 of this money comes from non-local tax revenue (mostly state education tax and grants, as well as federal grants and tuition and food income). The remaining 2/3 is apportioned among the towns and their property owners and goes into determining the local school tax rate for each town. A NO vote activates the Default Budget. The Default Budget replaces Fund 10, and thus a NO win lowers spending by about $60,000, a tiny 0.15%. The closeness of the operating budget and the default budget is an indication of how tight the board kept the increases this year. The default budget by law is the amount needed to honor existing contracts without any new spending. As the article states, rather than accept the Default Budget the board can try to get the voters to pass another one. There was still a bit of a fracas this year when it came out Madbury was getting a 6% increase in its millage (which reportedly turns out to be due to a substantial increase in the fraction of district students living in Madbury) and the board went back and cut some more to reduce this burden. Last year's warrant had fund 10 at $39.5M and total op at $40.8M. Naively, we're looking at an increase of 40.9/39.5=3.5% (fund 10) or 42.3/40.8=3.7% (total op). With the increase in revenue due to more tuition students, the amount asked of taxpayers increased by about 3%. Over the last six years the total district budget growth has impressively come in below inflation, and we've been shrinking relative to the state average since 2006. I hope we can keep that up. I'm voting YES on Article 8. See you all on Election Day, Tuesday, March 8. Vote Rotner & Newkirk! Thank you, Dean. All the info I needed to be an informed voter is here. Thank you so much Dean for this analysis. I've been out of town tending to a sick mother, but I just read your analysis, Dean, which I always find interesting. However, your argument for a track/field bond seems more an argument against one than for one. Personally I will be voting NO on article 3 on the School District Warrant (and YES on the Lee #3 Warrant Article). As you state, we will need a new MS soon, or at the very least, a huge renovation of our current MS. For too long we have deferred maintenance on that building and others while our administrators and Board have focused on.....you got it! Sports! I have nothing against sports, and my 8th grade daughter is planning on playing soccer next year. However, we are a small school and we understand the issue is field space, money (high taxes) and low enrollment. In the face of all that, we are taking some of that valuable space and building another field (a huge track and bleachers, with possible night lighting...watch out "Friday Night Lights!"). We are spending enormous resources on this track and artificial turf field. 1.9 million dollars to be raised to improve a few sports at our school makes no sense to me. We have one of the best schools in the state, and we are close to falling into a Newmarket situation. The State no longer contributes to school building funds like they did when the HS was built (and funded 50%, I believe). This means we are responsible for paying for an entire building by bond. We've seen how this has worked out in Newmarket. If this "sports" bond passes this year, do you really think the Lee voters will happily fund the MS in a few years? Do you remember how long it took us to fund the HS? Do you remember the lawsuits? Those who want a track have no concept of strategy or history and it's frustrating to watch. On top of that, there is NO Environmentally friendly fill except for dirt. EDPM is not recycled tire crumb, but it is synthetic rubber crumb. This Board and administration have reduced the Middle School's guidance department from 4 to 2 in the past few years. It is clear to me that their priorities are not the children's mental health, but increasing the number of trophies for our school. I find the whole thing ridiculous. If we have money to spend, spend it on the arts and STEM. Our HS students often have to wait years to get into a ceramics class. It's a good thing we are willing to spend millions for the jocks, though.